Day 2: Hitoyoshi - the heart of rice shochu in Japan - Kampai! : Kampai! The second day was my first full day in Kyushu. Waking up at 7:30am for an 8am pick-up left us with no time for breakfast before our drive to Kumamoto’s Hitoyoshi, home of 28 rice shochu distillers that collectively make “kumajochu”, the WTO Appellation of Origin that can only be given to rice shochus that are made with local spring water and that are fermented, distilled, and bottled in the Hitoyoshi area. 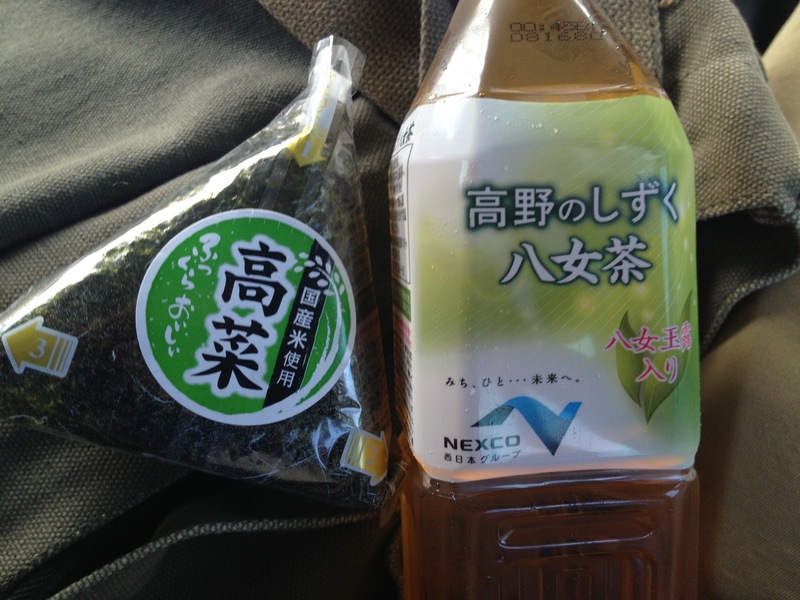 A quick rest stop yielded breakfast – green tea and takana (mustard greens) onigiri, a Kyushu specialty. Our first stop was at Sengetsu Shuzo, which makes the delicious muroka (unfilted) kuma shochu available in the US, Kawabe. Hitoyoshi Castle and the Kumagawa River are both visible from the 2nd floor of the kura. 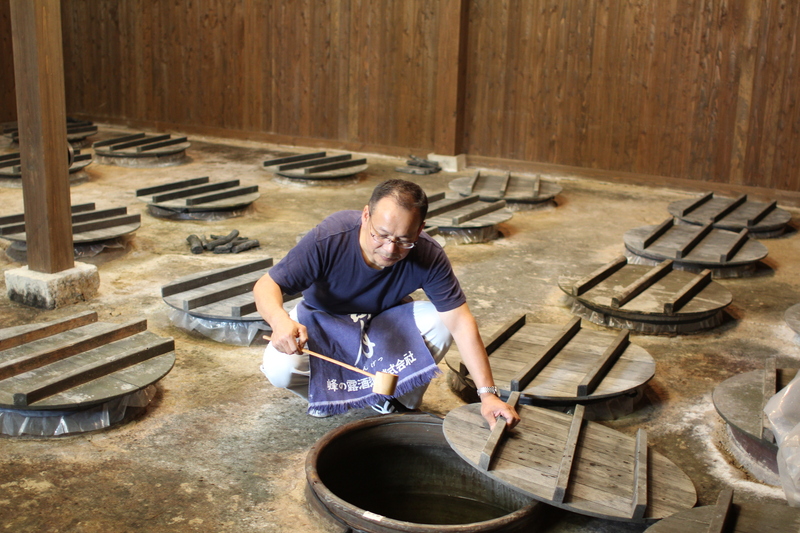 In 110 years of kome shochu production, Sengetsu has had just five tojis (master distillers). We were given a kura tour by the current toji, a humble, friendly middle aged man who takes the history of his position very seriously. He instantly gained my eternal gratitude upon allowing us to taste a 40 year old kome shochu directly from the aging kame. The shochu was made by the 3rd toji in Sengetsu’s history who served in that role for more than 50 years. Our next stop was Takahashi Shuzo, which makes the best selling Hakutake Shiro shochu – a light, crisp, clean shochu produced using modern equipment in a massive factory. This accounts for a full 50% of rice shochu sales from the Hitoyoshi region. 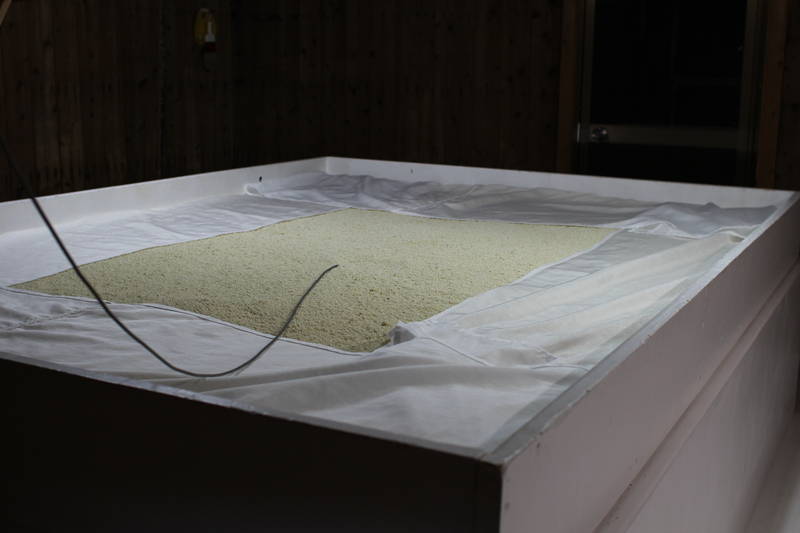 The production line is modern, clean, and automated, leaving only a few employees in each huge room for rice washing, koji production, fermentation, distillation, aging, bottling, and packaging. Picking us up at Takahashi Shuzo was Mizobe-san of the Kuma Shochu Manufacturer’s Association (www.kumashochu.or.jp). He was kind enough to take us to Tsutsumi Shuzo which makes the delicious, but hard to find Jidai Kurahachi, a clay pot aged rice shochu, and the impossible to find in the US or even in Japan, Mugen Dai hanatare (first drops) kome shochu, which I’d been fortunate enough to find in the massive Shochu Authority shop in Tokyo Shiodome. 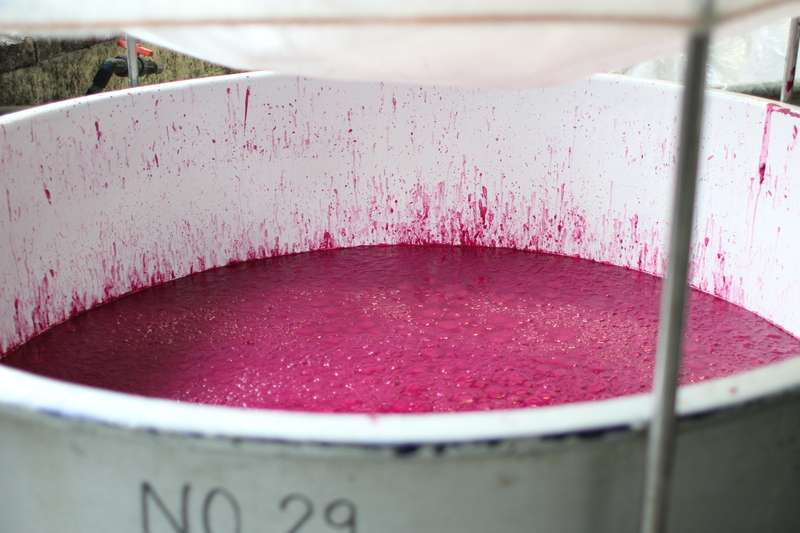 Surprisingly, when we visited Tsutsumi they were in the middle of making murasaki imo shochu from bright purple potatoes. The second moromi pots were bubbling like mad turning the starches into sugars into alcohol. Our final stop of the day at a time when I was completely wiped out with jetlag and only 5 hours of sleep was Jufuku Shuzo. I nearly begged off the final stop and when we arrived a gruff older woman was playing with a toddler on a table in what seemed like a garage. I seriously felt like we’d walked into a family’s house in a small town in rural America except all the decor was distinctly Japanese. This was the first kura where we didn’t exchange namecards and the woman seemed skeptical as to why this American was walking into her place late on a Friday afternoon. She seemed half ready to shoo us away and probably didn’t only because we were with Mizobe-san, who represents her interests throughout Japan. Once she realized why I was there and what I wanted she began an interrogation that lasted about 5 minutes. My answers pleased her apparently, because she lit up and began pouring us a variety of shochus, speaking to me in Japanese that I basically understood since every other word was a shochu term. When she discovered I was a fan of joatsu muroka kome shochu we were off to the races. Her strapping son – the fittest shochu toji I’ve ever met – gave us a whirlwind tour of their tiny kura, letting us walk into the koji room (only 2 others of the more than 20 distilleries I’ve now visited have allowed us into the koji room). He even produced his proprietary koji for us to inspect, left casually on a shelf in a plastic container. 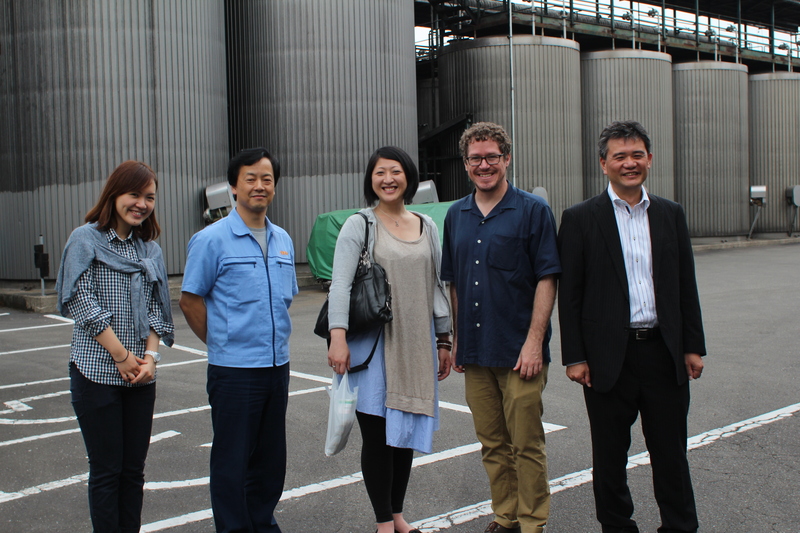 No other distillery has ever shown me their koji, let alone let me hold the container. He explained that everything they do is made by hand. There’s virtually no automation in this kura save hoses to move the 2nd moromi into the still. This would explain his fitness. He’s lugging around hundreds of pounds of rice, kome koji, and 1st moromi every day. Just as I thought the tour was over, the toji motioned for us to follow him out onto the street. We walked through another door down the road and were invited through a small garden and into a small Japanese house. 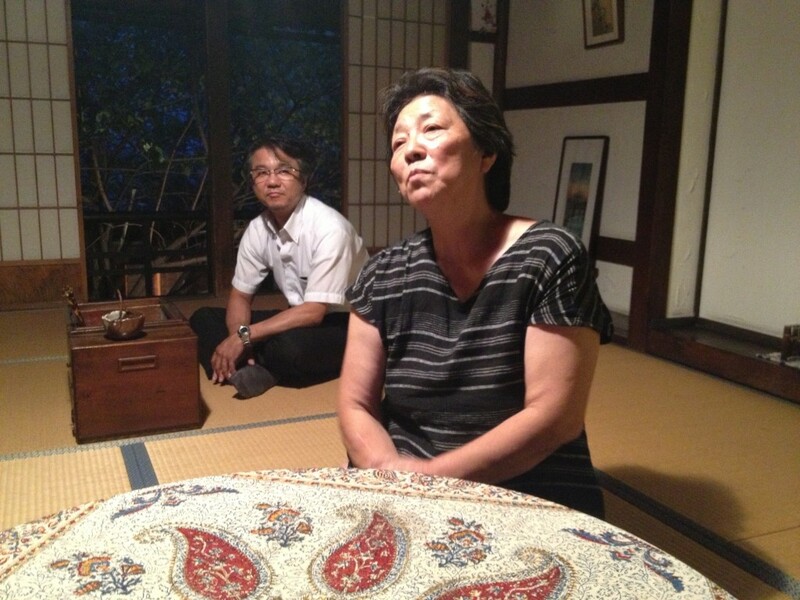 Removing our shoes, he gestured toward the the stairs to find his mother sitting on a tatami waiting for us. A small brazier sat nearby, old coals waiting for new fire. She explained that she wanted to drink shochu with us, but understood we had to go to our next appointment (how I wish we didnt!). 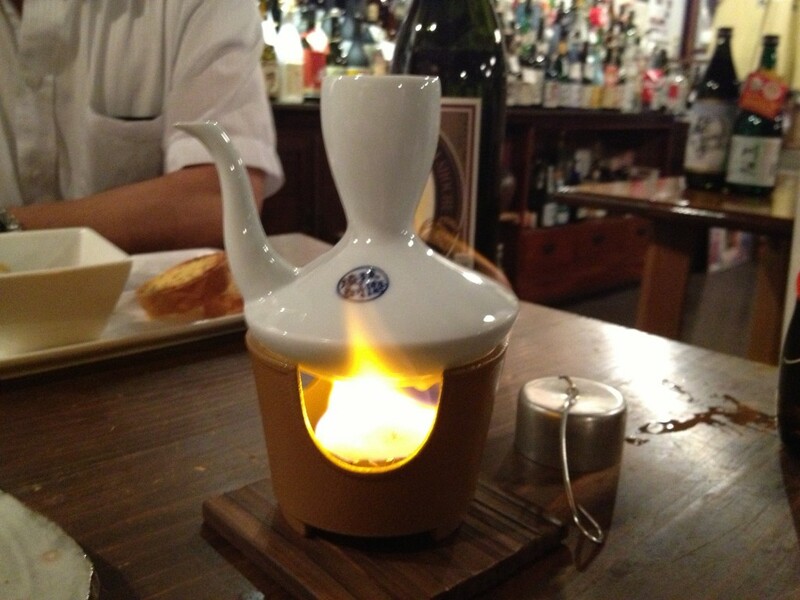 She implored us to drink her shochu the proper way – either heated directly or after being heated directly, poured over ice. She gave us a lengthy lecture on the correct way to drink any kome shochu, waving off those people who put everything on the rocks. With that she invited us back to drink with her next time – there’s no way I won’t take her up on that. Running late from the unexpectedly amazing experience at Jufuku Shuzo, we were hurried to our lodging at the ryokan (traditional Japanese hotel). On the wall outside the ryokan was my name in katakana welcoming “Stephen from America”. We all had a good laugh about this as all the other names were listed with cities, but I got the whole country. Unfortunately, I had virtually no time to relax in my room before we went to dinner. Kai is essentially a Kumamoto shochu education izakaya. It sounds completely bizarre until you’re there. The first floor is a shochu-ya, selling almost every label from all 28 kura in the Hitoyoshi region. All sorts of shochu souvenirs (omiyage) are available as well. I ended up picking up a Mushagaeshi iphone case. An impulse buy for sure, but Mushagaeshi is the most popular shochu from Jufuku Shuzo and I was so struck by Jufuku-san that I wanted to commemorate that visit. 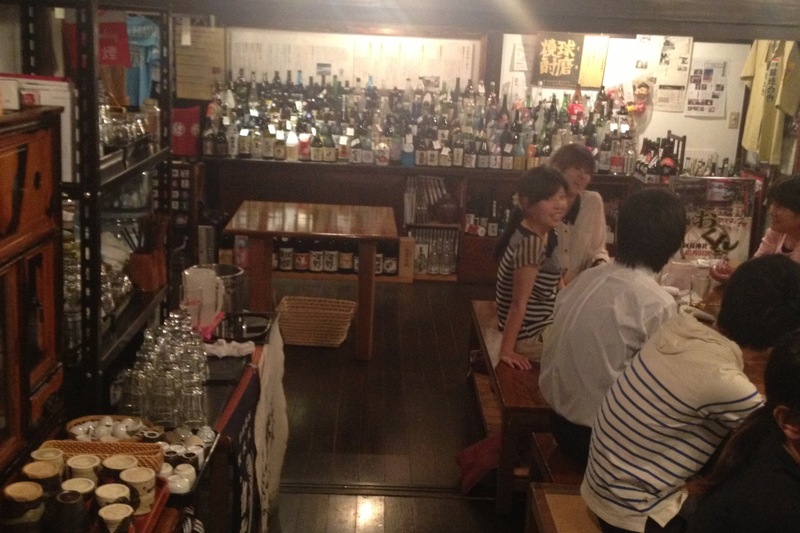 Once you get upstairs you find long tables and a bar covered with more than 200 kuma sochu. One wall has a shelf with glasses, ice, water, and other equipment needed to make your own shochus. A table next to your table holds the bottles you’ve tried and you’re charged per bottle you try based on the number of people you have in your party. We drank shochus from Sengetsu and Takahashi Shuzos since they were our hosts for the dinner. We tried a kuro koji kome shochu from Sengetsu just the way Jufuku-san had recommended, heated in a gara. It was stupendously good that way. We were invited to try another shochu from the shelf so I selected a ki koji muroka joatsu kome shochu, Hino Hikari. Earlier in the day one of the tojis had told me nobody made a ki koji kumajochu. I guess he hadn’t heard of this one. Even the Sengetsu and Takahashi folks were surprised to learn it was made with yellow koji (normally only used in sake production). I was exhausted by the end of dinner, which was a feast of local Kumamoto food meant to pair well with the shochus. But our hosts weren’t finished. 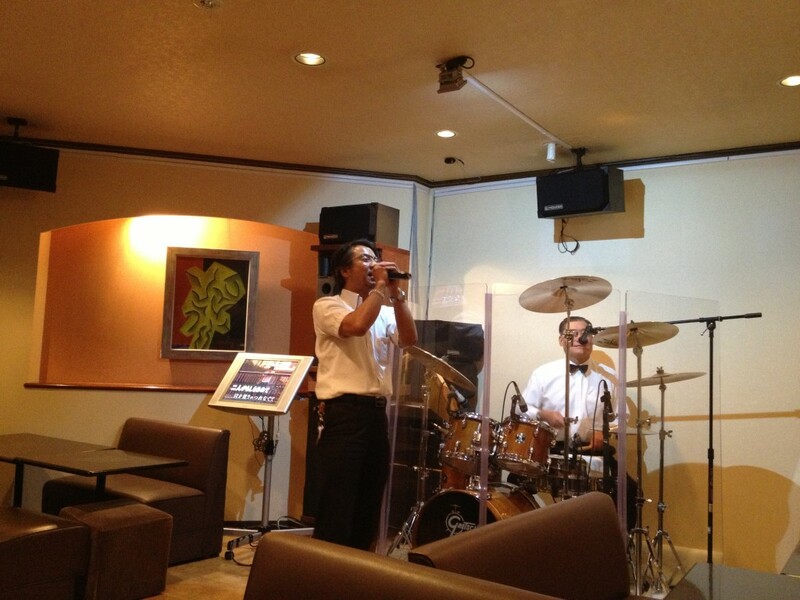 It was time for karaoke, Hiotoyoshi style. We visited “Boston” – a karaoke bar in which you’re accompanied with live musicians playing drums and piano along with other guests using tambourines and other small percussion instruments. Takahashi’s Matsuyoi and Sengetsu’s Kawabe appeared in isshobin (1.8L) bottles. Matsuyoi is an “all koji” shochu made with 100% rice koji. It turns out Mizobe-san is quite the singer. I finally called it a night at about 11:30, walking with my hosts back to the ryokan where I enjoyed my first Japanese onsen bath prior to sleep. A Hitosyoshi onsen is an experience not to be missed. Takahashi-san assured me we could start at 9am the next day, but Mizobe-san never got the message. But that’s tomorrow’s story. Dude, I’m green with envy! Unbelievable fun! It was a really special day, but this schedule is exhausting. I’ll need a vacation from my vacation! If I am not mistaken, I think that both Tori Kai and Fusanotsuyu Misty Blue, both of which are kome shochus and are produced in Kumamoto, use ki koji. You’re absolutely right. This appears to be a case where a toji won’t talk about other brands products and I mistook his statements to mean that ki koji kome shochu didn’t exist. They do, but his distillery doesn’t make any. What was surprising about the one I’d found on the shelves of Kai was that it was an uncompromising normal pressure (joatsu) muroka (unfiltered) shochu, which is very uncommon, triply so when made with yellow koji. The first thing you notice about Window’s Migaki and its sister shochu Window’s Mugiichi is the “window” of the bottle with artwork by artist Ichiro Tsuruta. Our photo doesn’t really do this artwork justice (her face isn’t crooked). Don’t let the pretty packaging fool you (with many wines the artistry of the label is directly inversely related to the quality of the product inside). Window’s Migaki is a barrel aged barley shochu (Mugiichi is this same shochu unaged) of the highest quality.